Today we are going to discuss this specific San Diego hot tub service account to show you things that may happen to your spa or hot tub. 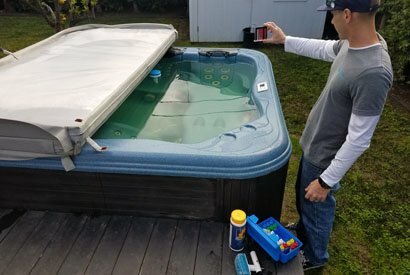 Due to the large amount of rains we have been having in San Diego, this hot tub cover suffered the wrath. 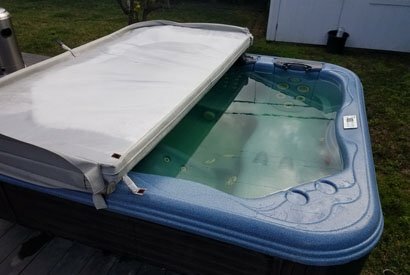 Because the hot tub cover is older and has small tears in it, allowed for water to get to the inside materials. This has caused the water to drain out into the hot tub causing the hot tubs water to change color. Gross! Well not really. The water is not out of balance, it has been stained and either needs time to filter out or it will need to have a hot tub drain and clean performed. As we have recently started doing this hot tub cleaning, we were already planning on doing the spa drain and clean so that we can ensure the water is able to be properly serviced and that it stays safe and enjoyable for the home owner. As with all of the hot tubs and spa services that we perform, we always pay the same special attention to the proper cleaning and complete water chemistry balances. 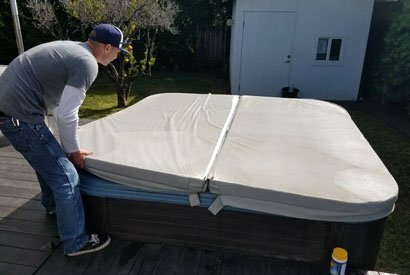 The first step we take when cleaning hot tubs and spas, is to remove the cover and do a quick visual inspection of the water. Next we will check the spa or hot tub water chemistry so that we can make any chemical adjustments and allow them to start working while we are cleaning the hot tub. This is a really good idea in case there are any major water chemistry changes needing to be made, we have plenty of time to re-test the water and making more slight adjustments. Spas and hot tubs are small bodies of water and the last thing you want is a spa or hot tub that has bad water chemistry. This may cause anyone using it encounter skin irritations, an uninviting feeling on the hot tub surface or a foul odor coming from the water. A properly maintained spa or hot tub should smell fresh and look clear giving the relaxed feeling you look for when enjoying the hot tub or spa. Once the water chemistry is balanced, we will thoroughly clean the water lines surface to remove any built up oils or debris along with completely vacuuming the steps and floors. Once all of our hot tub or spa cleaning services are complete, your hot tub will be ready to use as we never add anything that would cause you to loose time from enjoying yourself in your spa or hot tub. 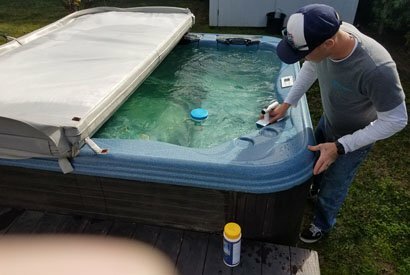 If you have this same issue with the stained hot tub or spa water, do not worry as it is only cosmetic and will not cause you any harm. ProTouch Pool Services offers complete weekly hot tub cleaning along with hot tub or spa drain and cleans throughout San Diego County.